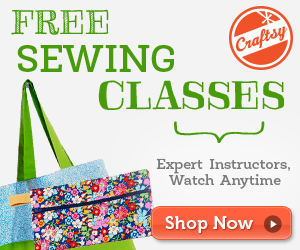 Anyone who has been sewing clothing for any length of time has had fitting issues. 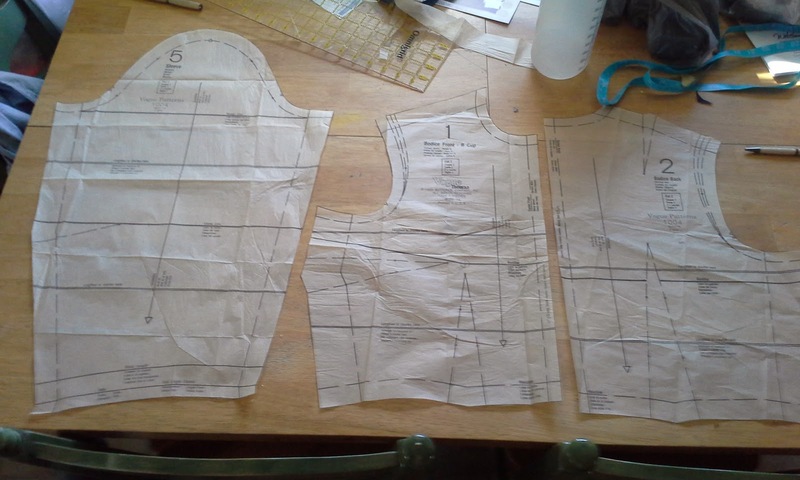 It might be the making the wrong size pattern or needing to adjust length and not knowing where to start. I have had Vogue 1004, the bodice & skirt sloper, for years. I have wanted to make it, but have always had something more fun or more important. 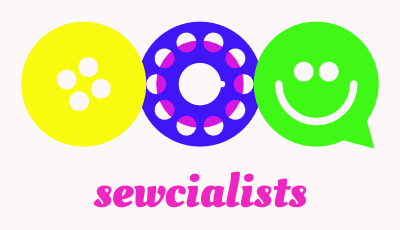 Well, Vanessa at Sew Filled to the Brim, is making doing the same sloper for herself and has encouraged me to do it. (I think she was chanting "Do It! Do It!") Since I am so easily influenced, I'm already working on it. The sloper has 12 pages of instructions and uses 5 pattern pieces. 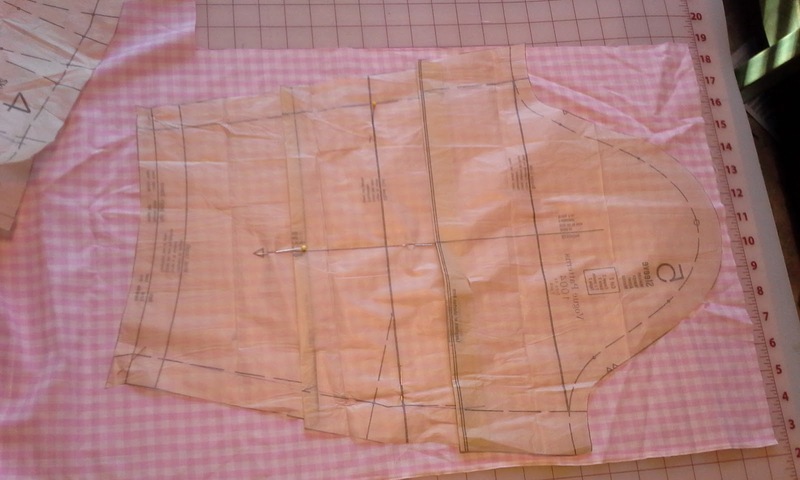 The sewing should be easy, but the point is to use it to fit and adjust patterns. 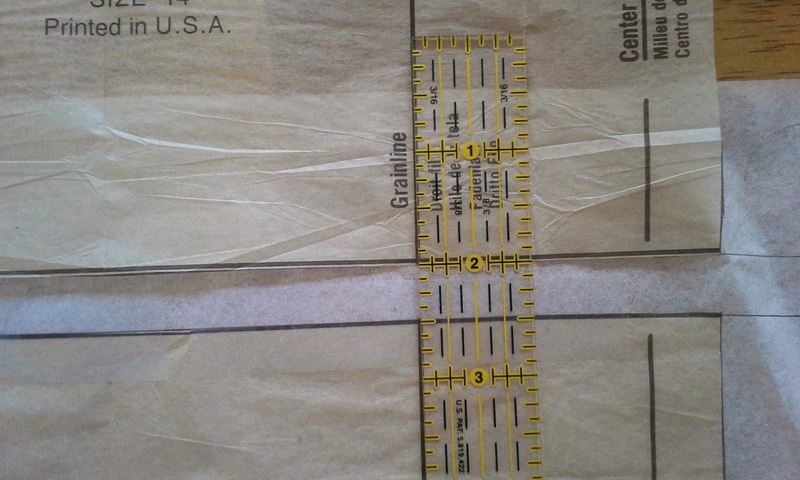 The whole process starts with taking accurate measurements. Some are difficult/impossible to do alone. I managed most, and had Mr. Toad help with a couple of the harder ones. Then transferring these to a chart to make adjustments to the standard size measurements. Using some 4th-5th grade math, you subtract to find the difference between the standard pattern size and your own. Using the differences in the chart, the length changes are made on the pattern. You know those adjustment lie on the upper bodice, lower bodice, upper back, lower back, upper sleeve, lower sleeve and between the waist and hip? Yep, those are where you will make length adjustments by folding or cutting and adding additional paper. If any of the lengths cross darts or seam lines, these will need to be redrawn. grainline to keep the bodice straight. After getting these length adjustments, we only adjust the waist and hip for the circumference differences. With these, divide the differences by 4 and use these to adjust in or out on the pattern. You will need to redraw new lines based on the new numbers. On the skirt, you will need to use a hip curve to adjust the line between the hip and the waist. If you changed the waist, you will need to redraw the line from the hip to the hem. It is best to use a hip curve. Since I had to add to my waist and subtract from my hips, I actually ended up with more of a straight line. I am going to make a creative/executive decision and will be adding 1 inch to the waist by removing 1/8 inch from each side of 4 waist darts and not adding 1/4 to each of the side seams. I may regret it, but that is what I'm doing. Getting ready to cut the length adjusted sleeve. I was tempted to use this gingham for a blouse! I am now at the cutting out part. I am using gingham because the checks will let me know if my design lines are horizontal or vertical. Because I really want my fabric to be on grain, I am cutting one piece at a time instead of the usual double. I am being careful to true my grain and make sure that the grainlines and the horizontal lines, bust, waist, hip, sleeve cap, etc. Remember to have one face down and one face up when doing this. After cutting, I will be marking ALL lines with tracing paper. I will then trace on the sewing machine with thread on all of the sewing lines before assembling with basting stitches. Since I'm done for the day, I will be resting to get going and hopefully finish tomorrow. How exciting! Looking forward to seeing how your slopers come together. I've been working on a bodice sloper myself, so I'm currently fascinated by fitting and adjustments. How do you like working with the Vogue sloper pattern so far? I am at the cutting out stage. I only have one front and one back done. My plan is to make another from a pattern book in the next few months and compare it with the Vogue. I also have the pants sloper. I hope you are blogging about yours. Tasha, I'm wishing I had spent the time to do this earlier. 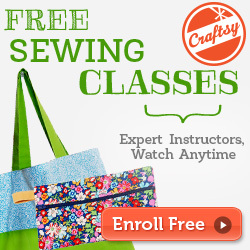 I would suggest taking some time and making a sloper before your next project. Nice job so far! I wish I had bought gingham fabric, but I had white muslin instead. I have been careful with the grain of the fabric as well. I am glad you decided to go ahead with your sloper. Vanessa, I am so glad you encouraged me! I'm really glad I am using the gingham. The checks are helping me line everything up. I can't wait to see yours. This is an excellent challenge. I'll be watching your progress! How about join in? I'd love to have others doing this and have us encourage each other! Liebster Blog Award! I was nominated!! New Domain Name & I Won A Drawing! 7 blankets sewn for The Red Island Project.